The followup to Startropics, released in the Nintendo Entertainment System's twilight days and only in North America (until many years later when the Virtual Console debuted). Does it prove to be a worthy sequel to a beloved NES cult classic, or is this just a franchise-killing dud? StarTropics was a modest hit for Nintendo, so naturally a sequel was inevitable. Unfortunately for many, it would come out almost four years later in early 1994, at a time when the NES was all but dead and the Genesis and Super Nintendo were the hot properties on the block, so it got relatively little attention. Zoda's Revenge was also something of a changeup in format from the first game. The game is still a relatively linear take on the Zelda format, broken up into distinct "chapters" with their own environments to explore, but Zoda's Revenge goes in a new direction by introducing time travel to the plot. Indeed, each chapter is now a different time period to explore, from prehistory to ancient Egypt to medieval Europe to Victorian England. Befitting this, each period has a much different aesthetic to it, as well as their own sets of sub-weapons and historical figures, both real (Leonardo da Vinci, Cleopatra) and fictional (Sherlock Holmes and King Arthur). This gets used to rather humorous effect a lot of the time, such as having to deliver a pizza to Cleopatra, and ends up feeling like the Bill and Ted movies at several points, which adds a bit to the game's charm. Not a lot has changed on the gameplay front from the first game. Most of the same powerups still appear here, and even the Bola sub-weapon makes a return, with the new weapons present mostly just being slight variations on that. Mike now gets two weapons instead of one for much of the game, with the second slot in his inventory always being taken up by the "Psychic Shockwave"; this tends to have better range and fire rate than your base weapon, but does slightly less damage overall. As in the first game, this does also power up over the course of the story, though once the player falls below a certain health threshold, the weapon will be downgraded to a weaker form until their health is restored. One significant change is that Mike's movement is no longer grid-based; he can freely move and fire in eight directions now, which can be slightly awkward for those who have adapted to the first game's control setup. Indeed, I found myself overshooting platforms on more than a few occasions at first, and in the later stages, missing jumps because I wasn't close enough to the edge before making a leap to the next one. The notable delay in the controls is also gone, so with a bit of time, you'll adapt to it and be platforming, shooting and dodging attacks with little effort. 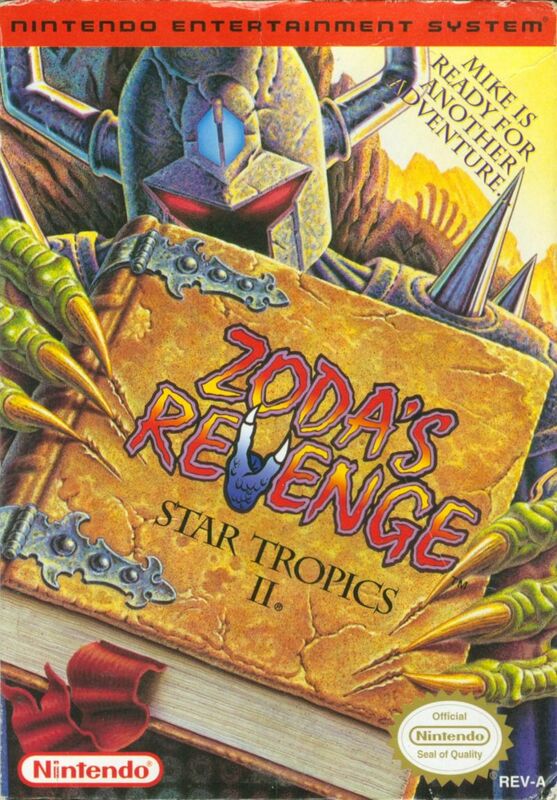 Zoda's Revenge is also a considerably more forgiving game than the original StarTropics. 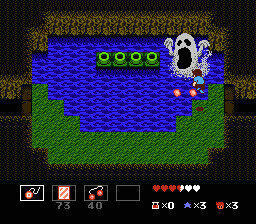 There are far fewer instances of cheap "death traps" that kill you for simply taking a wrong path, and enemies on the whole tend to do far less damage than they did in the first game (particularly making contact with bosses, which was almost always an instant kill in Startropics 1). The game is considerably more generous with powerups too, with quite a few more medicines and invincibility stars at the player's disposal, making some of the tougher battles considerably less harrowing. Startropics II isn't a perfect update, though. The sense of exploration is largely gone in this game, with the player simply following a linear path most of the time and very few hidden secrets both on the world map and in dungeons. One doesn't get the thrill of having a vehicle to operate as they explore (such things do exist, but only in storyline cutscenes) and a few of the levels feel relatively uninspired. In particular, I think of the Transylvania stage, which feels like it was thrown in at the last minute just to give the game a bit more longevity. The music also doesn't captivate in the same way the first game's managed to, feeling rather generic a lot of the time, and the enemy designs often feel like "token video game monsters", lacking much of the uniqueness and personality of the original game's. There are more than a few instances of palette swapped enemies too, which only serves to make the levels feel much less distinct than the original game's. In the end, Zoda's Revenge isn't quite as well-designed or memorable as the first game, but it remains a fun and captivating adventure. The sense of humor, as well as the enjoyable storyline that never takes itself too seriously, keep it fresh in spite of its somewhat generic design, and the gameplay is still strong enough to let it rank as one of the better action-RPGs on the system. It may have come just a bit too late in the NES's lifespan for it to get the proper attention from its devs or for a lot of fans to take notice, but it is a worthwhile sequel to an NES classic. Recommended version: All of the later versions are ports of the original, though again, some text is changed slightly (the seven "Tetrads" are now called "Blocks" owing to copyright issues). Based on a Japanese horror movie, Sweet Home was a unique RPG that also served to establish many key elements of survival horror (and, many years later, would serve as a primary inspiration for Capcom's Resident Evil franchise). But does Sweet Home still prove to be an enjoyable experience today, or is this just another forgettable take on the horror genre in gaming? Capcom as a company needs no introduction; if you've played video games at all from the mid-80s to anywhere in the modern day, you've probably played or at least heard of one of their games. Nowadays they're probably best known for Resident Evil, the series which coined the term "survival horror" and challenges the player to manage limited resources, avoid enemies when possible and make their escape from a dangerous, monster-infested environment full of traps and puzzles. 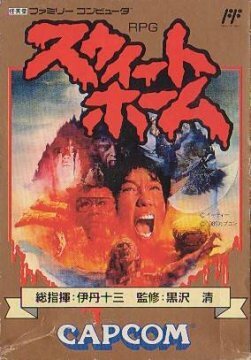 Years before the franchise debuted on the Playstation, though, Capcom had another prominent cult classic on their hands in Sweet Home, based on a horror film of the same name. (In fact, Resident Evil actually began its development as a remake of Sweet Home, but as Capcom couldn't secure the licensing rights to the film, they opted to make an original game instead.) Both games shared many similarities, but while Resident Evil was more action-based, Sweet Home was an RPG with turn-based combat and a team of five characters to control, each of whom had slightly different abilities and a unique item to use in both combat and solving puzzles. Sweet Home operates somewhat unusually for an RPG in that the party doesn't necessarily have to stay together; in fact, the maximum party size when not in a battle is three, requiring the player to split into at least two groups whilst exploring. However, one can temporarily have four or all five characters join in on a particular enemy encounter if they are in close proximity when the battle begins (or the other team moves closer to the team currently in combat), which proves to be necessary to defeat some stronger foes. A bit strange, but it does help to cover ground more quickly, and the fact that one gains levels relatively fast ensures that having a party of only two (or even one) won't put them at too severe a disadvantage. Many prominent elements of survival horror had their beginnings with Sweet Home; most prominently the emphasis on puzzle solving and the limited supply of healing items available. Frequently throughout, one will have to utilize each character's particular skill to clear obstacles, or simply find equipment along the way in the form of stronger weapons or objects that can be used to traverse hazards (such as wooden planks used to cross gaps in the floor, which can lead to a fatal drop if one steps over them unaided). Much of the plot is told through frescoes, hidden notes, journals and the like rather than simply unfolding through in-game dialog, letting the player feel as though they're slowly piecing together a mystery rather than walking through a linear JRPG plot. Similarly, there is only one type of healing item in the game (Tonic) and relatively few can be found, though it is worth noting that they will fully restore the entire party's HP when used, so one can easily maximize their mileage with them by grouping the entire party together before using one. Inventory space is very limited, with characters only able to carry their unique item, two extra items and one weapon, so careful management of resources is key. Sweet Home has some other unusual features, too. Unlike many RPGs of the time, there is no returning from death - once a character is dead, they're gone for good, which can put the player at a severe disadvantage for the rest of the game. 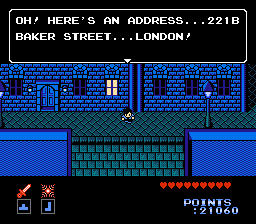 This isn't as unforgiving as it sounds, though, as the player can save their game at any time and reload if things get too out of hand, which it probably will a few times before the player is familiar with the mansion's layout and the placement of key items. Also worth noting is the fact that Sweet Home has five different endings, with the one the player gets depending upon how many characters survived; similar to Resident Evil or Silent Hill, this does add a bit of replay value to the game. Your five characters also contribute much to the proceedings with their unique abilities and items. Kazuo comes equipped with a lighter (a prominent item in Resident Evil as well) that can be used to burn ropes, light candles to traverse dark rooms, or simply damage enemies. 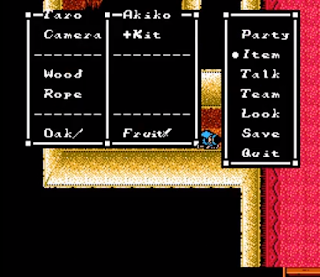 Akiko comes equipped with a health kit that cures status effects (but does not restore HP), Ryo has a camera that can snap pictures of the various frescoes in the mansion to uncover clues or damage certain enemies. Asuka the maid comes equipped with a vacuum cleaner, which can vacuum up broken glass or clean dust from frescoes so that Ryo can photograph them (though sadly you never use it to capture ghosts, Luigi's Mansion style), and finally, Emi has a key that can unlock many locked doors, making her extremely useful for acquiring extra items. As many familiar with the NES era of gaming knew, Nintendo was notoriously stingy about maintaining their family-friendly image, with a lot of darker and more violent elements of games either being censored or removed outright. Nintendo of Japan was much more lax in this regard, though, and Sweet Home is a perfect example. Not only is the game genuinely creepy, with a claustrophobic environment, eerie backing music throughout and very disturbing implications as one uncovers the plot, but it doesn't skimp on the gruesome sights either. Torture chambers, bloody skeletons, zombies missing half their faces, hallways full of carnivorous worms, and even some shockingly gory death scenes for the main characters are all prominent sights in Sweet Home, adding to the horror of the scenario in surprisingly effective fashion despite the limitations of the platform. Sweet Home accomplishes what it sets out to do, providing a horror-based movie game experience that not only proves to be surprisingly tense with its limited resources, but genuinely creepy too. The fragmented plot, emphasis on character teamwork to survive the numerous traps and enemies, and a consistently off-putting atmosphere make the game into an enthralling and memorable experience. Fans of survival horror should give it a look as a historical curiosity, while fans of RPGs owe it to themselves to check it out as one of the best examples of the genre on the system. As the latter, it's hard for me to play it and not feel just a little robbed; even if RPGs were a popular genre in the west at the time of the game's release, Nintendo probably wouldn't have let it fly outside of Japan anyway owing to its violent content. A relatively forgotten Nintendo IP which was developed by a Japanese studio but ironically never released in that region; only in North America and Europe. But does Startropics hold up to the test of time, or is this one short-lived franchise that is forgotten for a reason? The Legend of Zelda was a huge game in the early days of the NES and still a hugely influential one even today, so it's little surprise that other companies would try to make their own versions to cash in. From Golden Axe Warrior to the Neutopia games to Crusader of Centy to Beyond Oasis ("The Story of Thor" in some territories), Zelda's style of gameplay was far-reaching and, whether you played the original or not, you probably at least saw a game based on its style. But after the first game's success and the more mixed reception of the second game, it would be a while (and a new generation) before Nintendo released another entry in the franchise proper. Perhaps to tide over their western fans, Nintendo R&D3 and Locomotive Corporation created a new IP that drew inspiration from Zelda's format while working in more of a modern and irreverent style of narrative. Thus was born Startropics - a game set in the fictional C-Island chain in the southern hemisphere and following the exploits of Mike Jones, a teenager who embarks on a quest to find his missing uncle. As a nod to the modern setting, the player's primary weapon is a yo-yo, and several of the weapon pickups they find are similarly modern - slingshots, baseball bats, mirrors to reflect projectiles back at foes, and spiked cleats to attack all enemies on the screen at once. Similarly fitting are many elements of the adventure itself. The player encounters the usual complement of ruins, flooded caverns, hidden passages and switch puzzles in each one, as well as enemies like bats, snakes, mummies, skeletons and the occasional Indiana Jones-style boobytrap, several modern elements make their way into the proceedings too. The player soon acquires a submarine called the Sub-C to make their way between islands, and they interact with many silly characters and scenarios throughout the adventure like a talking parrot (that must be bribed with a worm) and a giant organ that one must play a specific song on to open a passage. Gameplay itself is reminiscent of Zelda in many ways, and the action element of the game is no exception. Taking place from a top-down perspective and having the player move from room to room, solving puzzles and defeating enemies, it's the same overall formula. Even the powerups are similar, with enemies dropping hearts to refill Mike's health, stopwatches to temporarily stop all enemies' movement, medicine to restore a portion of health on demand, or stars; collecting five of these will restore one heart to the life gauge. 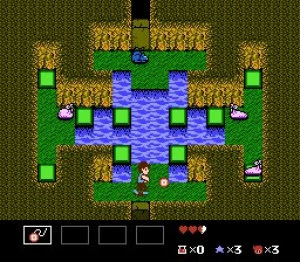 However, Startropics does have a few unique elements to distinguish itself. For one, most items the player finds and utilizes are specific only to that dungeon, and often limited in use besides; if one finds a lantern to light up dark rooms or a Rod of Sight to see invisible enemies, they will generally only get a few uses of it before having to find more (and all will be taken away once one dies or completes the dungeon). 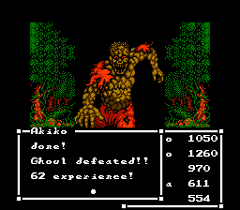 Second, the game operates on a lives system; the player begins with two lives, and dying while one still has lives left will simply cause them to restart at the last checkpoint rather than having to redo the whole dungeon. 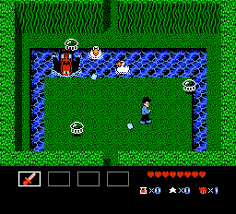 One's stock of lives will be replenished upon completing a dungeon, but one can also find a "Try Your Luck" sign as a hidden bonus in many levels that will grant one to three extra lives or, if unfortunate, take one away (thankfully it will not do this if the player is on their last life). A few unique powerups appear in specific dungeons too, such as Anklets (which double one's jumping distance) or Vitamin X (which maxes out the player's health gauge but causes any health over their maximum to slowly 'bleed off', similar to Quake). Startropics is a considerably more challenging beast than Zelda, though. For a start, Startropics loves to throw at the player death traps that can be considered "cheap", doing things like punishing them for taking a wrong path by forcing them to backtrack a significant portion of the dungeon or even causing instant death (with no forewarning of this fact at all). Second, the game is quite heavy on platforming puzzles, forcing the player to hop across numerous platforms in rooms to reveal a hidden switch, then hop over and press it, avoiding or defeating enemies all the while. Movement in the game is grid-based and somewhat stiff, which is fine for hopping platforms but can be somewhat cumbersome when trying to deal with a large number of fast-moving enemies. Enemies, particularly late in the game, can be downright frustrating, moving quickly and dealing huge damage (or even instant death) on contact while taking huge amounts of punishment themselves. Mastering the slight delay in your movement, as well as the art of jumping, turning and firing while in flight, quickly become essential skills to master, as does knowing the shortest route through the levels simply so you have fewer enemies to deal with on the way to the end. Another clever element of the game was a letter included in the game's original box, filling in a bit of backstory and providing a novel trinket for those who bought the game new. However, it saw use within the game itself too, as at one point the player is prompted to dip the letter in water in order to reveal a hidden passcode so that they can continue with the game. Naturally, those who bought the game used probably didn't get said letter with it, resulting in much confusion as they searched the entire game for something that didn't exist within its code. Naturally, Nintendo was deluged with questions concerning the letter and the code it held, to the point where they eventually gave in and printed the solution in a later episode of Nintendo Power. This was more a hallmark of games like Ultima on the PC, which included numerous trinkets and instruction books written from the perspective of in-game characters and the like, so to see it on a home console was a novel inclusion (even if it ultimately came back to bite its creators in a bad way). 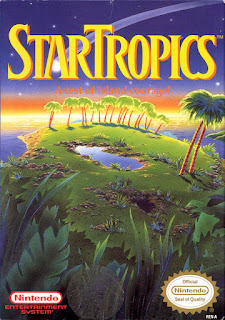 Startropics is a unique game in many respects - developed by a Japanese company but never released there, taking part in a quirky, humorous and modern setting years before Earthbound would arrive on the scene, and having a novel fourth wall breaking gimmick packed into its box that few console games before (or since) would ever attempt again. It may have been a bit clunky in gameplay and frustrating in design, but its charm shone through, delivering a fun adventure with a lot of twists, unique sights and creativity as ending up as a distinct and memorable game that stands out among the NES's best. It really is a pity that, despite its cult classic status, Nintendo hasn't really done anything with the franchise in twenty-five years save for the token digital re-release. Recommended version: All of the later versions are ports of the original, though with some slight tweaks; the Yo-Yo is renamed to the "Star" owing to a copyright issue, and the infamous letter's text is shown in the online manual, complete with a bucket icon one must click to reveal the hidden code.